I was lying on the floor of my van where the middle pilot chairs used to be, trying to hide from view. This is it, I thought. They know. I'm going to get kicked out of Duke. Moments before, I had been cooking a pot of spaghetti stew on top of a plastic, three-drawer storage container, which held all my food and my few meager possessions. I figured the campus security guard had parked next to me because he spotted the blue flame from my propane stove through the van's tinted windows and shades. I held my breath as he shut off the engine and opened his door. I was in my boxer shorts, splayed across my stain-speckled carpet like a scarecrow toppled by the wind. As I listened to what sounded like a pair of Gestapo jackboots approach the driver-side door, I thought about how I'd almost gotten away with it. For two whole months, I had been secretly living in my van on campus. For some, van-dwelling may conjure images of pop-culture losers forced into desperate measures during troubled times: losers like Uncle Rico from "Napoleon Dynamite," or "Saturday Night Live's" Chris Farley who'd famously exclaim, "I live in a van down by the river!" before crashing through a coffee table, or perhaps the once ubiquitous inhabitants of multicolored VW buses, welcoming strangers with complimentary coke lines and invitations to writhing, hairy, back-seat orgies. In my van there were no orgies or coke lines, no overweight motivational speakers. To me, the van was what Kon-Tiki was to Heyerdahl, what the GMC van was to the A-Team, what Walden was to Thoreau. It was an adventure. Living in a van was my grand social experiment. I wanted to see if I could -- in an age of rampant consumerism and fiscal irresponsibility -- afford the unaffordable: an education. I pledged that I wouldn't take out loans. Nor would I accept money from anybody, especially my mother, who, appalled by my experiment, offered to rent me an apartment each time I called home. My heat would be a sleeping bag; my air conditioning, an open window. I'd shower at the gym, eat the bare minimum and find a job to pay tuition. And -- for fear of being caught -- I wouldn't tell anybody. Living on the cheap wasn't merely a way to save money and stave off debt; I wanted to live adventurously. I wanted to test my limits. I wanted to find the line between my wants and my needs. I wanted, as Thoreau put it, "to live so sturdily and Spartan-like as to put to rout all that was not life … to drive life into a corner, and reduce it to its lowest terms." It wouldn't be hard for me to remain frugal. After buying the van and making my first tuition payment, I was only a few dollars away from having to rummage through Dumpsters to find my next meal. I was -- by conventional first-world definitions -- poor. While I faced little risk of malnutrition or disease like the truly poor, I still I didn't own an iPod, and I smelled sometimes. My experiment began in the spring semester of 2009 when I enrolled in the graduate liberal studies department. Months before, I had just finished paying off $32,000 in undergraduate student loans -- no easy feat for an English major. To pay off my debt, I'd found jobs that provided free room and board. I moved to Coldfoot, Alaska -- 60 miles north of the Arctic Circle and 250 from the nearest store -- where I worked as a lodge cleaner, a tour guide and a cook. Later, I worked on a trail crew in Mississippi in an AmeriCorps program. Between jobs I hitchhiked more than 7,000 miles to avoid paying airfare. When I couldn't find work, I moved in with friends. My clothes came from donation bins, I had friends cut my hair, and I'd pick up odd jobs when I could. Nearly every dime I made went into my loans. I hated my debt more than anything. I dragged it with me wherever I went. While I was still leading an exciting, adventurous life, I knew I could never truly be free until my debt was gone. I finally got out of the red when I landed a well-paying job with the Park Service as a backcountry ranger. Finally, after two and a half years of work, my debt was gone. I had four grand in the bank that was mine. All mine. It was the first time I had actual money that hadn't been borrowed or given to me since I was a 13-year-old paperboy. The more money I had borrowed, I came to realize, the more freedom I had surrendered. Yet, I still considered my education -- as costly as it was -- to be priceless. So now, motivated to go back to school yet determined not to go back into debt, I had to think outside the box. Or, as Henry David Thoreau might suggest, inside one. In "Walden," Thoreau mentioned a 6 foot-by-3 foot box he had seen by the railroad in which laborers locked up their tools at night. A man could live comfortably in one of these boxes, he thought. Nor would he have to borrow money and surrender freedom to afford a "larger and more luxurious box." And so: I decided to buy a van. Though I had never lived in one, I knew I had the personality for it. I had a penchant for rugged living, a sixth sense for cheapness, and an unequaled tolerance for squalor. My first order of business upon moving to Duke was to find my "Walden on Wheels." After a two-hour bus ride into the North Carolinian countryside, I caught sight of the '94 Ford Econoline that I had found advertised on Craigslist. Googly-eyed, I sauntered up to it and lovingly trailed fingertips over dents and chipped paint. The classy cabernet sauvignon veneer at the top slowly, sensuously faded downward into lustrous black. I got behind the wheel and revved up the fuel-funneling beast. There was a grumble, a cough, then a smooth and steady mechanical growl. It was big, it was beautiful, and -- best of all -- it was $1,500. I bought it immediately. So began what I'd call "radical living." I removed the two middle pilot chairs to create a living space, installed a coat hook, and spent $5 on a sheet of black cloth to hang behind my front and passenger seats so that -- between the sheet, tinted windows, and shades -- no one would be able to see me inside. I neatly folded my clothes into a suitcase, and I hung up my dress shirts and pants on another hook I screwed into the wall. I at first failed to notice the TV and VCR (that I would never use) placed between the two front chairs. Nor did I know about the 12-disc CD changer hiding under the passenger seat until weeks later. Fortuitously, I was assigned a parking lot in a remote area on campus next to a cluster of apartments where I hoped campus security would presume I lived. Over time, my van felt less like a novelty and more like a home. At night I was whirred to sleep by crescendos of cicadas. In the morning, I awoke to a medley of birdsong so loud and cheery you would have thought my little hermitage was tucked away in a copse of trees. During rainstorms, I listened to millions of raindrops drum against the roof and watched them wiggle like sperm down my windows. I loved cooking in the van. 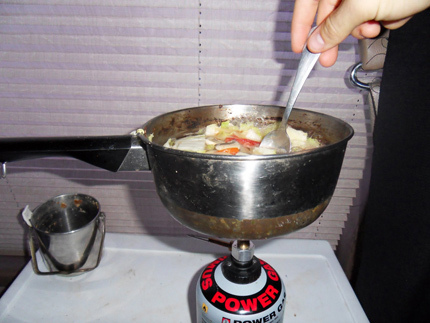 As an adept backcountry camper, I could easily whip up an assortment of economical and delicious meals on my backpacking stove. For breakfast, cereal with powdered milk and oatmeal with peanut butter became staples; for dinner, spaghetti stew with peanut butter, vegetable stew with peanut butter, and even rice and bean tacos with peanut butter. Without proper refrigeration, I cut out meat, dairy and beer from my diet entirely. I became leaner, got sick less and had more energy than ever before. By buying food in bulk I reduced my food bill to $4.34 cents a day. I was meticulous with my expenditures. I saved every receipt and wrote down everything I bought. Not including tuition, I lived (and lived comfortably) on $103 a week, which covered my necessities: food, gas, car insurance, a cellphone and visits to the laundromat. The idea of "thrift," once an American ideal, now seems almost quaint to many college students, particularly those at elite schools. The typical student today is not so frugal. Few know where the money they're spending is coming from and even fewer know how deep they're in debt. They're detached from the source of their money. That's because there is no source. They're getting paid by their future selves. My "radical living" experiment convinced me that the things plunging students further into debt -- the iPhones, designer clothes, and even "needs" like heat and air conditioning, for instance -- were by no means "necessary." And I found it easier to "do without" than I ever thought it would be. Easier by far than the jobs I'd been forced to take in order to pay off my loans. Most undergrads imagine they'll effortlessly pay off their loans when they start getting paid the big bucks; they're living in a state of denial, disregarding the implications of a tough job market and how many extra years of work their spending sprees have sentenced them to. But "facts do not cease to exist because they are ignored," as Aldous Huxley famously said. While I found a way to afford graduate school, I by no means had the same financial responsibilities as the average student. I was so poor when I applied that my department took pity on me and significantly reduced the cost of my tuition. I even found a well-paying part-time job working for a government-sponsored program, tutoring inner-city kids. Governments and financial aid departments normally aren't so helpful. For decades, the government has let legions of college students -- students who wished to better themselves and contribute to society -- go into soul-crippling debt. Schools don't make it any easier with steep hikes in tuition and baffling room and board costs. Students are oftentimes forced to pay for insanely priced meal plans and are barred from moving to cheaper housing off-campus. At Duke, the cheapest on-campus meal plan charges them 3.5 times more a day than it cost to feed me. Their dorm rooms cost 18 times more than my parking permit. Here, the average undergraduate student who's taken out loans graduates with more than $23,000 in debt -- about the national average. The cost of education at Duke, as at most schools across the country, is disgracefully high. Tuition costs (not factoring in financial aid) more than $37,000 a year. Additionally, students have to pay at least another $10,000 for books, meal plans, fees and dorms. Duke's egregiously hefty price tag is no anomaly. Nor is it unusual for students to unflinchingly take out massive loans that'll take them years, sometimes decades, to pay off. Willingness to go into debt, of course, isn't just confined to students; we're a nation in debt, collectively and individually. Going into debt today is as American as the 40-hour work week; or the stampede of Wal-Mart warriors on Black Friday; or the hillocks of gifts under a Christmas tree. An army of loan drones we've become, marching from one unpaid-for purchase to the next in quest of a sense of fulfillment that fades long before the bill arrives. We're little different from the Spanish explorers who dedicated their lives to the quest for El Dorado, which was always just around the next bend in the river, yet never there at all. I refused to join those ranks. I became a deserter, an eccentric, an outsider. At Duke, I felt like an ascetic in the midst of wealth, a heretic in the Church of the Consumer. I had to hide. Because I was so paranoid about campus security finding out about my experiment, I kept myself apart from other students. Whenever I did talk with a fellow classmate, I found myself souring the conversation with preposterous lies -- lies I'd tell to protect myself. Whenever someone asked me where I lived, I'd say "off campus," or I'd make up an address before changing the subject. I found it easier to avoid people altogether. I worried that if students caught wind of my experiment, a Facebook group would be created for "People who've had a confirmed sighting of the campus van-dweller." Campus security would find out, deem my lodgings illegal and promptly kick me out of the van and into some conventional and unaffordable style of living, wherein I'd have to buy a rug to tie the room together. Deprived of human companionship, I cloistered myself in my van and in libraries where I was alone with my thoughts and my books. Time for self-reflection, study and solitude was what I thought I'd wanted all along. But of all the things that I gave up for "radical living," I found it fitting that the one thing I wanted most was that which couldn't be bought. When a trio of laughing males drunkenly stumbled past my van, probably hoisting one another up like injured comrades after battle, I thought of my friends back home. On winter nights, when the windows were coated with a frosty glaze, I'd wish for a woman to share the warmth of my sleeping bag. While I have plenty of good things to say about simplicity, living in a van wasn't all high-minded idealism in action. Washing dishes became so troublesome I stopped altogether, letting specks of dried spaghetti sauce and globs of peanut butter season the next meal. There was no place to go to the bathroom at night. I never figured out exactly where to put my dirty laundry. Once, when a swarm of ants overtook my storage containers, I tossed and turned all night, imagining them spelunking into my orifices like cave divers while I slept. New, strange, unidentifiable smells greeted me each evening. Upon opening the side doors, a covey of odors would escape from the van like spirits unleashed from a cursed ark. But no adventure is without bouts of loneliness, discomfort and the ubiquitous threat of food poisoning. I loved my van. Because of it, I could afford grad school. So naturally I was nervous as I listened to the security guard's weapons jingle as he ambled by my windshield. But he just kept walking. I was overcome by an odd sense of dissatisfaction. Deep down, I think I wanted him to discover me. I wanted a showdown. I wanted to wave my arms at the dean and cry, "Impound my van? Over my dead body! I'll take you straight to the Supreme Court!" Fellow students would rally behind me. We'd stage car-dwelling protests and after winning back my right to remain voluntarily poor, people would begin to consider me the campus sage. I'd wear loose white clothing, grow my beard, and speak in aphorisms to the underclassmen who journeyed the mile on foot to my sacred parking space where I'd serve them tea. Today I still live in the van. I haven't taken out loans or borrowed money from anyone. Really, the only thing that's different is that I've set up my laundry area by the passenger seat. Also, after another summer with the Park Service, I have more money than I possibly need. Now, instead of being poor, I am radically frugal. Sometimes, though, I think it would be nice to have an ironing board, plumbing and a wood stove. It would be nice. A middle-class family might think it would be nice to have an in-ground swimming pool. A millionaire might think it would be nice to have a yacht. The billionaire, a private jet. Someone, somewhere might think it would be nice to have food to feed her family tonight. Someone, somewhere might think it would be nice to live in a van in order to afford to go to a wonderful school. I could begin satisfying my desires and buying comforts, but I've learned to appreciate what little I have instead of longing for what I do not. Admittedly, now that I have money I buy the fancy peanut butter from Whole Foods, and I've even purchased an expensive pair of hiking boots. But most things are the same: I still cook spartan meals, I don't have an iPod, and I park in the very same spot. And I still have my secret. Well, that is, until now. Ken Ilgunas is a journalist and the author of Trespassing across America: One Man's Epic, Never-Done-Before (and Sort of Illegal) Hike Across the Heartland.